Don’t actually know where to start, or if I really want to, to be honest. 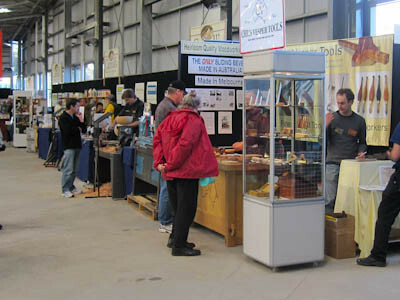 The show was tiny – about 1/2 the size of the Stitches and Craft show. Certainly doesn’t compare to wood shows of old. Took me about 10-15 minutes, and I had walked the entire floor plate. Takes about that long to walk the floor of the Ballarat Wood Show (and that is not a negative perspective of the Ballarat Show – Ballarat has a population of under 100,000 after all). Given that the Ballarat show is only 2 weekends away, it might be worth a drive for those who didn’t find the Melbourne show provided enough. For those exhibitors who had turned up, there are many who have put in a definite effort. The new Carbatec demonstration area looked great. The chairs that House of Dunstone bought along were beautiful. I am seriously hoping that they branch out into running some courses in how to make such fine furniture. Timbecon had a good display, covering a good range of heavy machinery, smaller machines, consumables etc. Carbitool had their normal, impressive range of router bits on display, Arbortech had their standard display, and their latest offerings. HNT Gordon had a typically impressive range of beautiful planes, including the stunning new addition to the stable, the moving fillister plane. The Warrior Wood Mill was set up outside, showing a range of their new log mills. But many more were MIA. Perhaps it had something to do with the organisers moving the date. And then choosing a date that clashed with one of the biggest woodturning events in Australia: the Phillip Island Down Under Turnaround. It may be by registration only, but I bet there were many people, and suppliers there instead, including Carrolls, and I daresay Ubeaut as well. And given the typical (but not exclusively by any stretch) demographic for the woodshow would also overlap V8 aficionados, even more potential visitors are dragged away. I don’t know what the crowds were like on Saturday or Sunday, but I sure hope for the exhibitors’ sake that it was better than Friday. I remember wood shows of old (especially in the early-mid 2000s) when crowds were so deep that the place pulsed with the enthusiasm of all present. I didn’t find any timber for sale. I might have missed a small pocket of sales (outside? ), but the only sales I could see were some long strips of veneer. Some really nice strips, if you want veneer. This, after all is what was promised. The Timber & Working With Wood Show is Australia’s premier event for woodworking. From the weekend hobbyist and home DIY’er through to the most experienced enthusiasts, this is a show you cannot miss! See the best in the industry, share their expertise, have fun trying new techniques and tools – and experience some of the world’s finest timbers… all at the one location! Can the wood show come back from this point? I don’t think so. Unless there is some plan for a small show one year, and a massive one the next (and nothing like that has been communicated), then I think the only way we will get to a show of any substance in the future at this stage is to head to the WIA in Las Vegas in 2017. If the industry (suppliers) have any interest in future wood shows, I think they all need to come together and organise a new model. 1 show a year in the entire country. One year in Sydney, the next in Brisbane, then Melbourne, then Perth, then Hobart, Adelaide, Darwin and back to Sydney again. 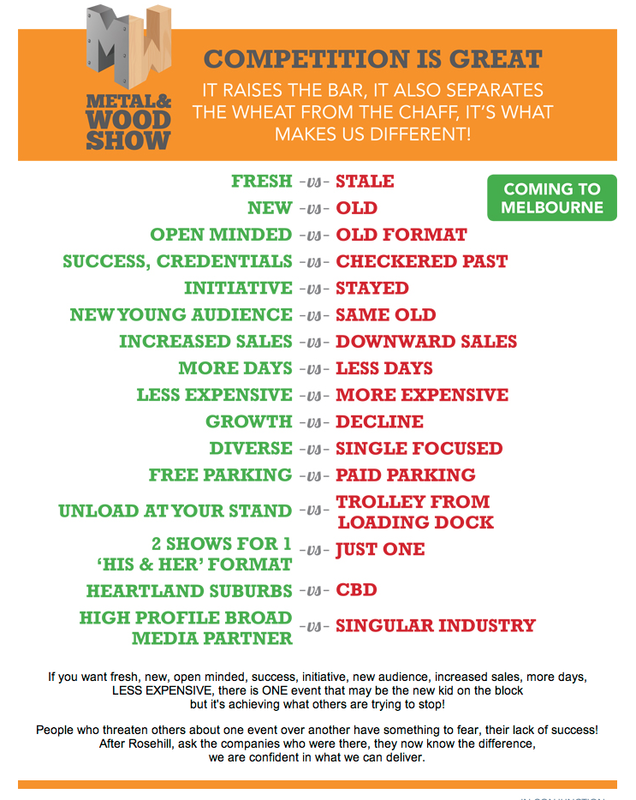 Pricing for exhibitors needs to be really affordable, to justify their efforts in attending the show. Pricing for visitors also needs to be really affordable – the show needs bodies to attend, and spend. Charge $10 max, and free for anyone under 18. Under 18s need to be encouraged, as they will become the woodworkers (and consumers) of the future, so sewing the seed that woodworking is a worthy pursuit to be passionate about will pay off in spades in 10-20 years time. Especially since we’d want as many people to attend from interstate each each annual show. That is absolutely not to say that regional woodshows (such as Ballarat) shouldn’t still run annually – we need them more than ever now. Anyway, this is all just my opinion. Not everyone will agree with me. I hope the show was a win for everyone. I just can’t see, with the cost of exhibition space, the lack of visitors, and the lack of exhibitors how it would have been. I miss the spectacle of a real wood show already. And on that happy note, I’ll sign off here. I’ll touch on what I did find at the show in upcoming posts. Looks like the Timber and Working with Wood Show is moving again, not only to a new home, but a new date. It is now on in September, 11th to the 13th at the Caulfield Racetrack. Door prices are still $16, but there is free parking. Doesn’t clash with the AFL Grand Final, which is in October this year, and it finally manages to avoid the MotoGP at Phillip Island, which was normally the same weekend. Of course, it does make it the same weekend as the Sandown 500, which is, to my mind, a similar demographic – perhaps with some age separation? 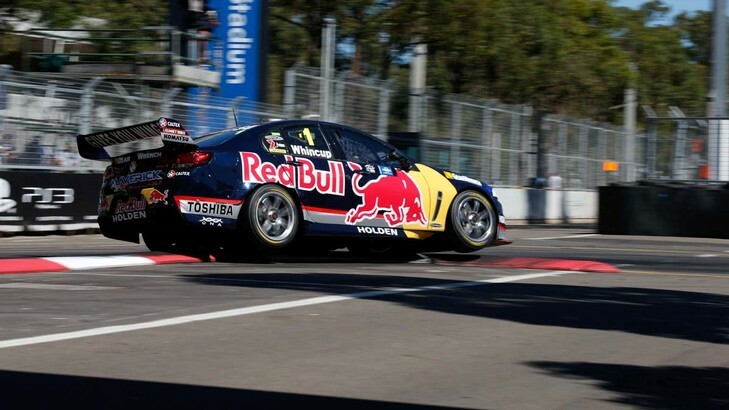 For some of us, that makes it a real choice: the one V8 Supercars race that is held locally in the year, or the annual wood show? With an attendance in the vicinity of 200,000 over the weekend at the Sandown 500, that won’t impact too badly on Working with Wood Show numbers would it? We’re off to see the wizard, the wonderful wizard of wood! But it is bigger than ever – previous ‘full’ catalogues were around 150 pages. The latest one is massive – 384 pages! Of course, going that large does come at a price – literally. A whopping $5. Or free if you spend over $100. Do hope the show has some new stuff to see – as much as I enjoy catching up with people, and restocking consumables, the show should be about new products, new techniques (and not just the same old). As much as sales are needed to justify the huge expense of a stand, the show itself needs to encourage more than that. Check out a Maker Faire, or the AWFS for how other shows do it. A week from today (in fact many will even start a day before that), the majority of the work goes into setting up the stands for this year’s Melbourne Working with Wood Show. It is that time again already! As in 2011, I won’t be doing anything formal at this show (although due to much less controversial circumstances), but still have no intention to miss it! As many will be aware, the location has changed for this year, with a return to Jeff’s Shed, although at a smaller scale to the last time the show was there. And no, I don’t intend to call it “The MCEC” – if you say it quickly, sounds like something my cat does after eating grass! You can find the official list of exhibitors here, and map here. Had to look up some of the exhibitors – no idea who they were. Still don’t?! There are plenty of stands I am looking forward to getting into. Henry Eckert and HNT Gordon are always particularly dangerous stands, as is Chris Vesper’s next door – fine handtools are always a real temptation. Carroll’s Street (as I call it, perhaps Carroll’s Lane) is well done. Vermec (and their CNC) and 3D Printing will be getting a fair few questions! This is just a sample of what I will be looking at, and there are plenty of others worthy of mention as well, but perhaps just head along and enjoy what is on offer! This is a smaller show that what we are used to in previous years, and as much as I believe shows should be about getting a company’s name out there, promoting up-coming products, and generally selling the brand, I also understand it is an expensive business and most are hoping to make as many sales as possible. This is the main parameter they use to justify coming back in future years, and it is concerning to see it continuing to shrink. All I can say is – I hope the companies are doing what they can to provide the customers in the way of good prices and interesting stands. In turn, we do need to buy things, not only because new tools are always welcome, but also because we want the wood shows to survive. I always have a great time at the show, working or not. Hope you do as well! You’ve heard of Whale Wars, Storage Wars even Abalone Wars. Now, to a city near you comes “Woodshow Wars”. The first few stones have been thrown, and whether you agree with the content or not, they have a singular target in mind. News to hand, is that the Melbourne Timber and Working with Wood Show is returning to Jeff’s Shed for 2013! I’m sure there are many pros and cons, and reasons why the decision was made to return to what is officially called the Melbourne Convention and Exhibition Centre. This year, it is on from the 18th through to the 20th October. Not sure what (if any) my involvement will be, but one way or another, I will be there, if only as a visitor! So there you have it, to the cries of joy of some, to despairing wails of others.